SCP-TROLL-J - Black Knight Guild Prod. Two instances of SCP-1995-J-A immediately before containment. Artists rendering of an instance of SCP-1995-J-B. No instances of SCP-1995-J-A have been captured or observed in their Beta state. Special Containment Procedures: The phenomenon of SCP-1995-J is known to have instances currently outside containment; every effort is to be made to secure and contain known instances. A Level III (or higher) Foundation Artificial Intelligence (currently AI-Theta-5 "Dungeon Trawler") is to monitor all suspected internet discussion forums searching for posts likely made by instances of SCP-1995-J.. 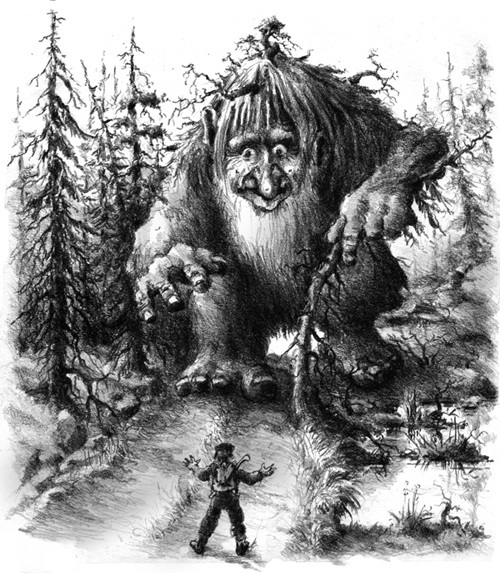 In the event of a positively identified instance of SCP-1995-J, Mobile Task Force Psi-95 ("Billy Goats Gruff") is to be dispatched to detain the instance. Once secured, instances of SCP-1995-J are to be contained in Level 4 (Physical Threat Likely) Humanoid accommodations. Any instance of SCP-1995-J currently in its Beta state is only to be exposed to direct sunlight (natural or artificial) as a means of termination; all instances of SCP-1995-J currently in their Alpha states must be kept in direct sunlight (natural or artificial) at all times to prevent their transformation to the Beta state. Instances of SCP-1995-J are under no circumstances permitted access to computers or other devices connected to the internet. Description: Instances of SCP-1995-J, colloquially referred to as "trolls," are humanoid entities which, through willful action, attempts to disrupt a community or garner attention and controversy through provocative messages. They have been recorded in European folklore since at least the 9th century CE; the Foundation has worked to contain instances of SCP-1995-J since its inception. Historically believed to dwell in isolated rocks, mountains, and caves (especially in Scandinavia), instances of SCP-1995-J are now known to also reside throughout the world. Instances generally live in relative isolation, either alone or in small family units, preferably in dimly lit locations such as basements or under bridges. Instances of SCP-1995-J are believed to have two physical states (SCP-1995-J-A and SCP-1995-J-B), and are thought to be able transform between their Alpha and Beta states at will. To date, no instance of SCP-1995-J has been captured in its Beta state, and no instance has complied with requests to transform into that state (even when given both positive incentives to do so and negative incentives for failure to do so). Accordingly, the exact appearance and physical properties of an instance in its Beta state are unknown. In their Alpha state, instances of SCP-1995-J are physically indistinguishable from normal human beings within the general population. Based on their behavior patterns, they are believed to have slightly higher computer skills and appreciably lower social skills than most humans. In their Beta state, instances of SCP-1995-J are believed to be incredibly ugly humanoids. They are often described having long, coarse, and unkempt hair; males (and by some accounts females) sometimes have beards. They are generally depicted as having large noses. Their size can vary substantially, ranging from less than one meter in height to four or more meters in height. Some instances in their Beta state have no heads (or more accurately, with heads indistinguishable from their torsos), while others are reported to have several heads (often with varying personalities). Reports generally suggest instances of SCP-1995-J in their Beta state demonstrate less intelligence than most humans, but greatly superior physical strength and durability. It is widely believed that instances of SCP-1995-J-B will undergo rapid fossilization when exposed to sunlight; this is supported by the fact that instances of SCP-1995-J-A in Foundation custody have never transformed to their Beta state while in direct sunlight. Regardless of their physical state, instances of SCP-1995-J have demonstrated hostility and lack of cooperation with Foundation personnel. Instances of SCP-1995-J are to be considered hostile and dangerous. Instance has been in Foundation custody for no fewer than five years. Instance has never transformed to his/her Beta state while in Foundation custody. Instance has displayed good behavior for at least the previous four years. Approval of the Personnel Director and SCP-1995-J Research Project Lead. Any instance approved for D-class status is not permitted to work with computers or other devices connected to the internet. This is a mistake! These people aren't actual trolls! - Dr. Sturluson, posted on Site ██ intranet message forum.